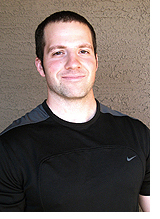 Today’s guest interview features Patrick Ward, a great strength coach and massage therapist I love learning from. If you don’t read his blog already, be sure to check it out. Enjoy! Patrick, even though you’ve been featured on the site via my podcast and a guest blog post in the past, could you tell my readers a little bit about yourself? PW: Thanks for having me, Mike. It is always very humbling to be asked to get interviewed. In short, I am a strength coach and massage therapist. I currently reside in Phoenix, Arizona. Aside from my day-to-day practice of working with athletes, either in a hands-on, more “in-person” role, or via more of a consulting role, I also run my website/blog, www.optimumsportsperformance.com, where I frequently share some of my ideas or things I have been trying based on things that I have been reading or studying. How did you originally get into the fitness industry? PW: It never really occurred to me that people could make a living doing this stuff. I was always into sports and working out ever since a young age. However, when I graduated high school I had decided that I would go to college to study music. I studied jazz guitar at Berklee College of Music in Boston, MA. I still worked out all the time, and read a lot of training and nutrition magazines (I still have stacks of Flex magazine, Muscle and Fitness, Muscular Development, and On Fitness that I collected during my four years of college in my parents’ home back in Cleveland, OH). Once I graduated, I moved to New York City to try and make it at as a jazz musician. Unfortunately, you can only play so many $20 gigs before you need to pay rent (and NYC isn’t cheap!) so I was forced to get a day job. I noticed he was reading this stuff and started talking to him about it. One day he asked me why I didn’t just leave and try and make a living in that field instead of working a day job. I wasn’t aware that this was even possible, so I asked him if he had any ideas, and he said I should get certified as a personal trainer. So, we both ended up getting certified through the NASM and got a job at the local gym. Fast forward 11 years and here I am! For anyone interested, the 17-year-old kid who talked me into all of this ended up going on to study biochemistry and is currently working toward a PhD in some incredibly complex stuff that I barely understand (haha). Tell us about your current setup; I know a lot of people find it not only cool but quite unique as well! PW: My current setup is probably not that different from what most others who own small studios have. People come in, get assessed, train hard, and prepare for their sport. Where I might be different is that I take an approach to training that emphasizes striving for the physiological adaptations that are desired for the client’s sport, or for success in whatever it is they are trying to accomplish. I feel like there are a lot of coaches who just feel that all athletes are the same, and that all athletes need strength, power, and some conditioning. I try and be a bit more specific than that and look at other factors involved. Within this approach, I use various methods of measurement to help gain an understanding of how an athlete is adapting (or not adapting) to the training stimulus I am placing on them. One of the processes I use is Heart Rate Variability. HRV is a way to gain an understanding about the autonomic nervous system of the client, and how various stressors may influence their system one way or the other, which may cause us to make changes to their program. The product I currently use with my clients is the Bioforce. Because of this sort of constant monitoring, my programs tend to be a little more free and flowing rather than so set in stone. I feel like there are a lot of people in our profession who just rely on the “four-week program and then we change it up” way of thinking. Sometimes we might train hard for several days and get a certain response, and that might cause me to alter the program to account for what I am seeing. Generally, like most people, I think, I have my training blocks written out complete with goals, qualities that we are looking to bring out, and a direction I want to go in. But, I am also open to making changes if need be. No two people will adapt the same way to the same program and I try and be sensitive to that. On top of this, I also use soft-tissue therapy as needed during the process to help influence things, whether it is enhancing a certain movement, addressing a limitation, or using it as general work to help promote better recovery during certain phases of training. You’re obviously very well known for your ability to combine performance training with your massage skills. What originally drove your interest in massage? PW: I was reading a lot of stuff from Charlie Francis and noticed that he always seemed to have massage therapists around to help with the recovery aspect of training. So, I started to get massages for myself once a week to see if I would like it (since I had never gotten one in my life up until that point). It was great, and I really felt like I was getting a benefit from it. Then, I met Willem Kramer, a physiotherapist from the Netherlands, who really helped influence me to get into massage therapy. I signed up for school and went after it. It has been a lot of fun. There is a ton of stuff to learn and know, and I am always trying to find a balance between studying anatomy and soft-tissue therapy, and studying physiology and training. It is hard to be a master of two disciplines, and it will take me my entire life to really figure out how all this massage stuff works and fits in, but it has been a fun journey thus far. You actually teach at a massage school as well, correct? What are some of the biggest mistakes you see people making early in their massage careers? PW: Yes, that is correct, I currently teach the last massage class that the students have to take before graduating. It’s a clinical integration class where we discuss the mindset behind what we are doing – why we are treating certain things, how we develop a treatment approach, assessing the body, etc. It’s a lot of fun. I think there are two key mistakes that students make early on. The first has to do with understanding anatomy. It is really important to understand where you are placing your hands and what you are attempting to achieve. Students usually have a pretty low-level understanding of anatomy, and some don’t see the point in being so detailed about it. I’m telling you though, it is killer! The more you know about anatomy, the more it seems you can do. The second has to do with knowing how to perform basic massage skills. Often, students want to get into sports massage and they think that learning basic massage is too, um, basic. This is a mistake! A HUGE mistake! Learn the basics, learn to do them well, and use them when needed. General massage can be a powerful tool if your touch is good and the clients body receives your touch well. If you hack at it and think that “digging stuff out” is the way to go, you may end up with more treatments backfiring. I just wrote an article about this on my blog recently. Could you describe that briefly to my readers? PW: Yeah, that was a pretty fun event, because I got to work with two guys who are not only my friends, but also really great colleagues who have influenced my thinking along the way. Hopefully the DVD will be out soon (within a few weeks). Basically, the idea of a buffer zone is that it is an area between two points. In the case of the physiological buffer zone, those two points are the line of physical capacity and the line of breakdown, pain, injury, etc. In athletes with a large PBZ, they can honor all three of these qualities. On the flip side, in athletes that have a small PBZ, they tend to break down in one or several of these areas. And per your lectures, we know that if you have a narrow PBZ you’re more likely to get injured, so how do you go about widening it instead? PW: The key is to take these categories and figure out which areas need improvement. Then we figure out what we can do about via our training and/or restorative strategies. Keep in mind that for some athletes, the weak link might lie outside of their training and competition environment. As strength coaches, we are really like managers of the athletes’ ecosystem. Like any other ecosystem in nature, many things influence the athletes’ ecosystem:financial stress, family stress, travel, sleep, hydration, nutrition, lifestyle, competition, practice, therapy, etc. We are always trying to strike a balance between these things and keep some sort of balance in the athlete’s “stress account,” as I’ve written about on my blog). A lot of this stuff would be on educating the athlete about what they are doing or are not doing, and then also having some sort of checks-and-balances system to understand what stress the athlete is under. In other words, we are attempting to scale back or ramp up their training program based on their level of preparation that day. This would be one way to look at the “stress resistance” piece of the equation: How does the athlete tolerate their stressors? Do they have coping mechanisms to deal with their outside stressors? And do we have ways of determining the level of stress they are under and making changes to the program if need be? Another thing that I think is key is enhancing the athlete’s sports-specific fitness. Many coaches seem to focus on general qualities all the time and seem to think that the athlete will automatically get better when they go to play their sport. I think it is critical to remember that our job is to prepare the athlete to compete in their sport. Our job is to not just make them stronger, make them run a faster 40, make them increase their vertical jump, or improve their work capacity. Those all may be goals of training, and very much needed for a particular athlete, but it is how we put everything together that is key and then it is how all of those pieces work together to prepare the individual for their sport. Let’s say you’re a soccer player. If I make you faster in your 40m sprint time but it takes you 3min to recover enough to display that faster 40m time that we gained in training, then I really didn’t make you any more prepared to play your sport, did I?. I made you faster but I didn’t make you better. The movement piece is something that I feel like coaches are already considering and thinking about a lot, so I am not going to harp too much on that one. Coaches seem to have a good grasp of why they need to assess movement and what they can do about it. I do think that one dangerous thing, however, is that people tend to get carried away with their corrective exercise and movement approaches, and they never take the next step to load the athlete or progress them to higher levels of training. Again, if I make you move better but you are weak and unfit then all I did was make you move better but I didn’t make you better at your sport. It is easy to stand up there and lecture and tell people to “move better,” but you have to also tell them it is okay to take the next step and load up once you have better movement. This is something that I think Charlie does really well compared to others out there who are preaching a “movement first” approach. He tells you to put some heavy stuff in your hands and challenge your body! You read a ton, along with attending seminars and hanging out with super smart folks on a daily basis. What are one or two big things you’ve learned or started implementing in the past year? The human body is really complex. We can theorize all we want about what we think we are getting with our training or therapy interventions, but at the end of the day we don’t really know for sure. I find that the more open I can be about saying, “I think it may be X but I don’t really know,” the more options I begin to see. It is a very liberating feeling. Obviously some people won’t like this because they want things to be very clear-cut. Unfortunately, things are rarely that black and white in the human body, so trying to be open and honest is a really important thing. It might not mean that you change what you do, or it might mean that you change just some of what you do. But either way, you need to be humble about what you are doing, because what you believe today might not be true tomorrow. Since you’ve been on the Podcast before I can’t give you the “typical” final question. Instead, we’ll go with the same theme, but in a different light. I was listening to your Sports Rehab Expert interview a few weeks back, and you talked about how you were now going lighter with your massage work than ever. Can you explain why you’re doing that, and what led you to that line of thought? PW: Most therapists just think that if it is an athlete they will want “deep work.” What we do is invasive. You need to be sensitive to the individual’s own level of tolerance, as well as their level of stress, as different techniques and approaches can evoke different autonomic changes. The goal is really to not be deep at all. “Deep” is just an excuse to take your elbow and thrash it in someone’s back. Trust me, I’ve done this and made this mistake before. Saying that you have “experience” is just a really nice way of saying that you made a lot of mistakes! That being said, in my experience, I’ve found that by working more gently and by being more aware of everything that is going on in the treatment session, I have been able to get better results. I work only to the level of depth that is necessary for that individual, and I try to be very specific (again, anatomy is king!). Being specific is the goal. The more specific, I am the more “tender” or “deep” someone will perceive my therapy to be, even though I am not really working that deep at all. Patrick, thanks a ton for taking the time to be with us. Can you tell my readers where they can find out more about you? PW: Thank you for having me, Mike. As I stated earlier, my website is www.optimumsportsperformance.com. If you’re interested in the DVD that we talked about, keep an eye on my website for updates on its release. You can also find out about any speaking engagements I have coming up on the website as well. Off the top of my head, I know I will be in Vegas toward the end of August to assist Judith DeLany in teaching a Neuromusclar Therapy Course at the World Massage Festival. In October I will be doing two lectures in San Diego (weekend of the 14th) and I will be speaking at the NSCA Arizona State Clinic (Oct 20th) as well. Hope to meet some people out there! Mike and Patrick – It’s always great getting input/ideas from both of you. I also spend my time between training and massage and continue to get “experience” through practice and more education. I like the idea of the Physiological Buffer Zone and think it applies extremely well to general population, too. It explains why those with a small PBZ need more careful consideration with programming and treatment – even if you do things well, if you’re not specific enough, your clients can still easily suffer setbacks. Thanks for the interview, and I look forward to checking out the Strength in Motion DVDs soon! I really like Patrick’s thought process. His emphasis on recovery, individualisation and application of the right amount of stress has been a big influence on my own treatments and training programs. This “The more specific, I am the more â€œtenderâ€ or â€œdeepâ€ someone will perceive my therapy to be, even though I am not really working that deep at all.” was golden!